Construction Engineering Reference from C.H.I.P.S. This book condenses closed form buckling solutions of columns, beams, arches, rings, plates and shells from the vast literature into a single volume. It begins with an introduction to elastic buckling and the importance of elastic buckling load. 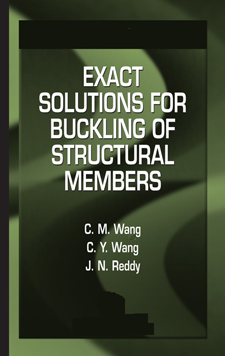 The following chapters present coverage of flexural buckling solutions for columns under various loads, restraints, and boundary conditions; the exact flexural-torsional buckling solutions of beams; and the buckling solutions of circular arches and rings. Also included in these chapters are discussions of the effect of transverse shear deformation on the buckling load of columns and the flexural-torsional buckling of columns for thin-walled members with open profiles. The final chapters discuss the elastic buckling of plates under inplane loads and buckling solutions for cylindrical and spherical shells. With coverage of a wide range of buckling load problems, this innovative reference provides engineers and researchers benchmarks for assessing the validity, convergence, and accuracy of solutions obtained by numerical methods.